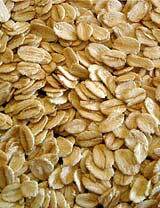 The Oat Flakes we offer are made from steamed whole oats that are rolled out to flatten. The flattened oats are then flaked into small pieces while retaining the nutritional value of whole oats. Our Oat Flakes are extremely high in fibre contain a number of other useful vitamins and minerals. Oat Flakes are ideal to eat as a breakfast cereal .It is also used to make various baked foods like scones, muffins, cookies, biscuits, noodles, and bread creating additional texture and adding to the nutritional value of this food. Why our Oat Flakes ? Recommendation : 3g of soluble fibre daily from oatmeal, in a diet low in saturated fat and cholesterol, may reduce the risk of heart disease.